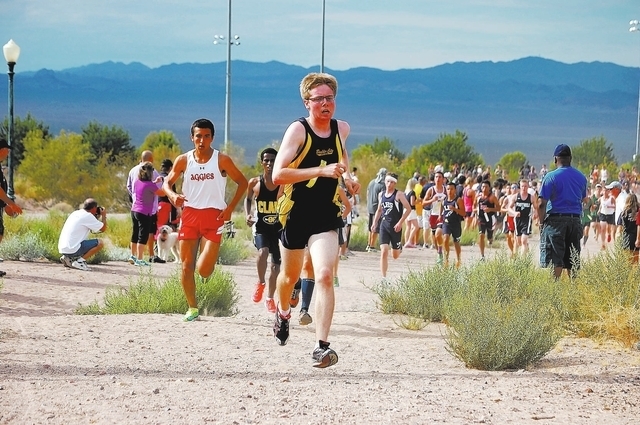 Boulder City senior Chandler Harkins ran 17 minutes, 58.1 seconds over the 3.1-mile course to finish in third place in the season-opening Larry Burgess/Las Vegas Cross-Country Invitational on Saturday at Veterans Memorial Park. Harkins and his teammates helped the Eagles score 49 points and finish in third place behind champion Tech, which totaled a low of 29 points. Eagles senior Evan Klouse ran 19:00.5 to finish seventh, while Christian Shamo placed 11th. Jessica Embro led the Lady Eagles, finishing eighth in her first cross-country race in Nevada since moving from Georgia. Boulder City finished fourth among the teams in the 1-A race. “I think that with hard work for two months, Jessica and her teammates will do even better by the end of the season,” Petersen said. As expected, Harkins faced his toughest competition in the 1-A race from Tech’s Martin Ponce and Clark’s Mucuranyana Amon. Ponce had a winning time of 17:03, followed by Amon’s 17:16.1. Harkins and Ponce were ranked as the two top runners in preseason in the Sunrise League by the coaches, and were among top three in the Southern Region along with Amon. “It will be a very challenging season for Chandler, but he will do very well, I’m sure,” Petersen said. “Evan also put in a solid effort with his finish. Combining those two with Christian, Caleb and Joren, we finished third and that was good for our first meet of the season. Petersen said he expects the Lady Eagles to improve. “I think that with hard work for two months, Jessica and her teammates will do even better by the end of the season,” Petersen said. “Niquel Nussear and Emma Torgesen also had great efforts and helped propel us into fourth place. The teams competed again Wednesday at Hemenway Park against Virgin Valley and Lincoln County. They will next compete at 4:30 p.m. Wednesday against league opponents Chaparral and Tech at Hemenway Park. Senior Kurt Steinke scored with nearly five minutes left Monday to lift the Eagles to a 5-4 against visiting Del Sol. Boulder City rallied from a 2-1 halftime deficit for the win. Senior Yann Moncayo added two goals and an assist, junior Victor Andrades added a goal and assist. Senior Nicholas Walker had a goal and two assists. The Eagles will host Adelson School (0-1) at 4:30 p.m. today, then will travel Tuesday to Chaparral for their first Sunrise League contest 3 p.m. Tuesday. The Lady Eagles started strong in their season opener before holding on for a 4-3 win Monday at Basic. Boulder City, which led 3-1 at halftime, was led by junior Jane Nevarez’s two goals. Senior Jana Williams and Vilde Svedsen each added goals for Boulder City. The Lady Eagles had their season opener Wednesday against Cheyenne (2-0). The team will open Sunrise League play Tuesday against Chaparral (0-1) Tuesday at home at 3 p.m. The Lady Eagles traveled to Canyon Springs on Tuesday for their first full match of the season, coming away with a 25-13, 25-12, 25-20 sweep. Senior Whitney Barlow had 11 kills and six digs, and senior Kendall Miller added five aces and 12 assists in the win. Junior Alyssa Ybarra had three aces and nine digs, and sophomore Tara Cox added six assists. The Lady Eagles will hold their first home match 5 p.m. today against Faith Lutheran (3-5), the defending Southern Region champions. Boulder City will travel to Basic (1-1) on Tuesday for a 5 p.m. match. The Lady Eagles tennis team has picked up right where it left off last season. The defending Sunrise League champions blanked visiting Sunrise Mountain 18-0 on Monday, and then downed visiting Desert Pines on Tuesday, 12-6. The doubles teams of junior Sariah Gneiting and junior Alexis LeMaster, and freshman Natalia Fullmer and junior Madeline Montgomery both went 3-0 to lift the Boulder City (3-0). The Eagles (2-1) downed visiting Desert Pines on Tuesday, 10-7 to earn their first on-court victory of the season. Sophomore Gavin Morris went 3-0 in singles play to lead the Eagles. The boys won their Monday match against Sunrise Mountain by forfeit. The boys and girls tennis travel to Chaparral on Tuesday for 3 p.m. matches. Reporter Pedro F. Fonteboa can be reached at fonteboavegas@yahoo.com.